SMART interactive displays, whiteboards and collaboration software are easy to use applications and devises aimed at the educational and private sector. The displays are touchscreen, allowing technology to help facilitators, students and business people share and interact with ideas. The Progression Design Agency were approached by SMART to work on a specific, UK-based summer sales promotion. 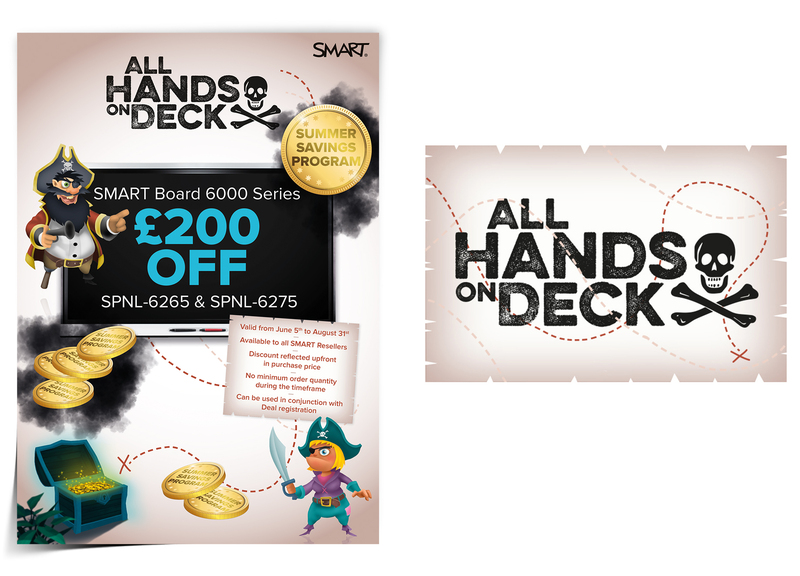 Aimed at the reseller, the promotion offered a discount on unit costs for a specific model within the SMART range which sold into the educational sector. Initially, Progression presented a range of concepts, before settling (with the client’s approval) on the ‘All hands on Deck’ strapline. The premise behind which comes from a specific application within the SMART whiteboard which uses pirates and treasure to teach children. Progression developed a ‘summer savings program’ gold coin which was also used throughout various touchpoints, further reinforcing the monetary value of the promotion. Along with a webinar presentation, Progression designed a series of email footers, Powerpoint presentation slides, Facebook banners, LinkedIn adverts and campaign postcards.